You now know how you can read data from a database using CodeIgniter, but you haven't written any information to the database yet. In this section, you'll expand your news controller and model created earlier to include this functionality. To input data into the database, you need to create a form where you can input the information to be stored. This means you'll be needing a form with two fields, one for the title and one for the text. You'll derive the slug from our title in the model. Create a new view at app/Views/news/create.php. There is only one thing here that probably look unfamiliar to you: the \Config\Services::validation()->listErrors() function. It is used to report errors related to form validation. Go back to your News controller. You're going to do two things here, check whether the form was submitted and whether the submitted data passed the validation rules. You'll use the form validation library to do this. The code above adds a lot of functionality. The first few lines load the form helper and the NewsModel. After that, the Controller-provided helper function is used to validate the $_POST fields. In this case, the title and text fields are required. CodeIgniter has a powerful validation library as demonstrated above. You can read more about this library here. Continuing down, you can see a condition that checks whether the form validation ran successfully. If it did not, the form is displayed; if it was submitted and passed all the rules, the model is called. This takes care of passing the news item into the model. This contains a new function, url_title(). This function - provided by the URL helper - strips down the string you pass it, replacing all spaces by dashes (-) and makes sure everything is in lowercase characters. This leaves you with a nice slug, perfect for creating URIs. After this, a view is loaded to display a success message. Create a view at app/Views/news/success.php and write a success message. The only thing that remains is ensuring that your model is setup to allow data to be saved properly. The save() method that was used will determine whether the information should be inserted or if the row already exists and should be updated, based on the presence of a primary key. In this case, there is no id field passed to it, so it will insert a new row into it's table, news. However, by default the insert and update methods in the model will not actually save any data because it doesn't know what fields are safe to be updated. Edit the model to provide it a list of updatable fields in the $allowedFields property. This new property now contains the fields that we allow to be saved to the database. Notice that we leave out the id? That's because you will almost never need to do that, since it is an auto-incrementing field in the database. This helps protect against Mass Assignment Vulnerabilities. If your model is handling your timestamps, you would also leave those out. Before you can start adding news items into your CodeIgniter application you have to add an extra rule to app/Config/Routes.php file. Make sure your file contains the following. 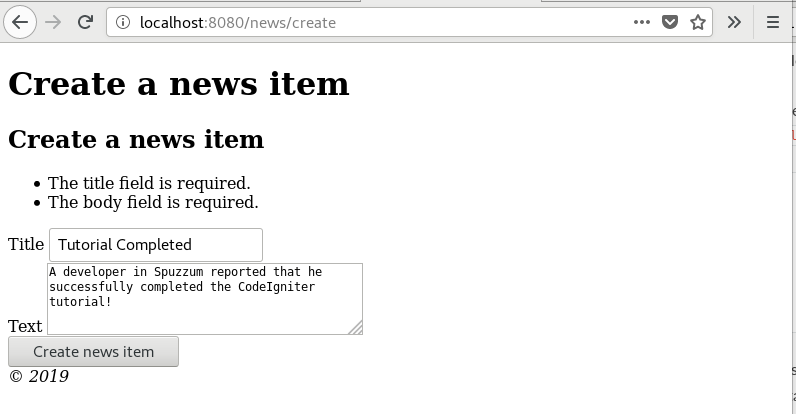 This makes sure CodeIgniter sees 'create' as a method instead of a news item's slug. Now point your browser to your local development environment where you installed CodeIgniter and add /news/create to the URL. Add some news and check out the different pages you made. You just completed your first CodeIgniter4 application! The image to the left shows your project's app folder, with all of the files that you created in green. The two modified configuration files (Database & Routes) are not shown.